Within minutes of starting our hands on session with the Nintendo Switch version of L.A. Noire, Rockstar's classic 1940s-set detective title, we're confronted with the sprawled out body of a female murder victim. Fully naked, badly beaten and mutilated, this poor woman's body has been dumped in the hills above the Los Angeles neighborhood of Westlake with a pair of initials scribbled on her torso in red lipstick. Not exactly the kind of experience you'd expect to have on a Nintendo console. We're not in New Donk City anymore. Perhaps that's what makes L.A. Noire such a perfect choice to act as Rockstar's Switch debut – the game is so far removed from anything else on Nintendo's hybrid machine that it comes as a refreshing change of pace from the colorful, kid-friendly characters that usually populate the console. As police detective Cole Phelps, you'll be tasked with solving a number of crimes within the Homicide, Vice and Arson divisions of the LAPD. To do so, you'll need a mind for investigation, a keen eye for detail, problem solving skills and, of course, a quick trigger finger. Though the game was originally released for PS3 and Xbox 360 back in 2011, some new bells and whistles have been included in the Nintendo Switch version to make this re-release worthwhile for those revisiting the game. For starters, being able to play the game while on the go is an incredibly attractive prospect. 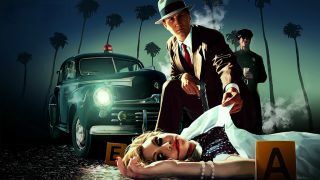 Perhaps more than any other title in the Rockstar repertoire, L.A. Noire lends itself best to short bursts of gameplay. No matter how much free time you may have at any given moment, you can always jump into one of your cases and progress it a little bit, whether it be through the collection of clues or the interrogation of a suspect. Visually, the game looks as good as it did when it was first released, displaying at a clean and crisp 1080p resolution in docked mode and 720p in handheld mode. You might occasionally notice some pop-in during driving sequences, but with an open world as vast and detailed as the one that developer Team Bondi has built here, that's a small price to pay. Everything from the streets you patrol to the clothes on the characters' backs has been meticulously crafted with a sense of period accuracy that is unrivalled in gaming to this day. When L.A. Noire was first released, we were blown away by its implementation of groundbreaking facial capture technology, allowing its characters to express themselves in an unparalleled manner with Hollywood-level acting. We're happy to report that the Nintendo Switch version of L.A. Noire faithfully reproduces the game's astonishing facial animations without sacrificing anything. It's a good thing, too, as reading the faces of your suspects and deciding on whether they're telling the truth or lying through their teeth is a major gameplay component. One thing we noticed was that the interrogations themselves have been streamlined for this updated version of the game. You now have three clear options to pick when responding to a suspect's story: Good Cop, in which you play along in a supportive manner, Bad Cop, which sees you get aggressive with your questioning, and Accuse, which is fairly self-explanatory. These three options will now appear next to your suspect in large, noirish lettering. The trick is in paying attention your suspect's body language and reactions – accuse them too early and they'll clam up, leaving you to pursue a different, and often more difficult avenue. "I already told you coppers – I simply cut myself shaving." Being a Switch release, this version of L.A. Noire offers a number of different input methods that take advantage of the console's unique features. Obviously, the game can be played with a Pro Controller for precision handling similar to what was available in the game's original release. In handheld mode, you can also use your Switch's touchscreen to interact with crime scenes and clues, tapping on items to pick them up and moving them around with the drag of a finger. This touch functionality also makes it easier to interact with your notebook, which is where your clues, addresses and questions for suspects are kept. A new simplified form of movement has also been introduced, allowing you to tap on your surrounding environment and have Cole walk towards it. Among the other extras included in the Switch version are new unlockable outfits and two new cinematic camera angles, which allow the player to get a much wider view of a crime scene, as well as a closer look with a tighter, over-the-shoulder viewpoint. "My keen detective skills are telling me this man is dead." From our brief time with the Nintendo Switch version of L.A. Noire, we came away very impressed with what Rockstar was able to achieve on the portable console. Without question, this is the L.A. Noire that you know and love, without any sacrifices made for portability. Visually, the game is a knockout, already proving to be one of the best looking games on the console, and the gameplay is as engrossing as ever. We're definitely excited about the prospect of making L.A. Noire part of our daily commute. Thankfully, we won't have to wait much longer, as the Switch version is set for release on November 14, 2017. Until then, keep your hats on your heads and your eyes on the streets, gumshoes.